Welcome to our monthly overview of Microsoft's Windows security updates. We provide you with full details of all released security and non-security updates for Windows and other Microsoft products. Check out the executive summary at the top if you are in a hurry, or go through the list of released updates and click on the links that point to Microsoft's Knowledgebase to look up additional information. The overview includes the vulnerability distribution per client and server operating system, as well as for Edge and Internet Explorer, the list of patches, download information, and information about Microsoft Office and security advisories. Microsoft planned to release the Windows 10 Spring Creators Update, version 1803 today, but it appears that the release has been delayed. Microsoft released security updates for all supported client and server versions of the Windows operating system. Microsoft lifted the update block restriction for Windows 7, Windows 8.1 and server variants on devices without HKLM\SOFTWARE\Microsoft\Windows\CurrentVersion\QualityCompat\cadca5fe-87d3-4b96-b7fb-a231484277cc Registry setting. Microsoft released an update for the Microsoft Malware Protection Engine on April 3, 2018. Provides support to control usage of Indirect Branch Prediction Barrier (IBPB) within some AMD processors (CPUs). Access violation issue in Internet Explorer. Enterprise Mode redirect issue in IE and Edge. SVG access violation issue when under high load in Internet Explorer. Updated time zone information issues. App-V service may stop working on RDS servers that host many users. User accounts locking issue when moving apps to a shared platform using App-V.
ActiveX content printing issue in Internet Explorer. Internet Explorer did not identify custom controls correctly in some instances. Lifted blocking of updates via Windows Update and WSUS if "antivirus compatibility" Registry key was not set. Stop error when the update from previous month was applied on 32-bit systems with PAE mode disabled. SVG high load rendering issue in Internet Explorer. Issue with identifying custom controls in IE. KB4093223 -- Security Update for Windows Server 2008 and Windows XP Embedded -- Patches Microsoft graphics remote code execution issue. KB4093224 -- Security Update for Windows Server 2008 and Windows XP Embedded -- Fixes Microsoft graphics component denial of service vulnerability. KB4093257 -- Security Update Windows Server 2008 and Windows XP Embedded -- patches a buffer overflow vulnerability in the Microsoft JET Database engine and an elevation of privilege vulnerability in Windows Adobe Type Manager Font Driver. KB4093478 -- Security Update for Windows Server 2008 -- patches information disclosure vulnerability. Windows Update History reports that updates did not install because of 0x80070643 even though they did install. KB4089848 for Windows 10 version 1709 -- non security update that fixes lots of issues. KB4018337 -- Excel 2016: security update that patches a remote code execution vulnerability and includes non-security improvements. KB4018328 -- Office 2016: patches remote code execution vulnerability and includes non-security improvements. KB4018339 -- Word 2016: patches remote code execution vulnerability and includes non-security improvements. KB4011667 -- Office 2016: fixes crash that occurs when adding an account that has already signed in. KB4018322 -- Office 2016: blocks minors from running or obtaining add-ins without parental consent from the online store, and adds translation for the message why an Office add-on cannot be loaded. KB4018329 -- Office 2016: update for Office 2016 Language Interface Pack. KB4018326 -- Outlook 2016: adds support for Sync Slider, improves some translations, an issue with favorite folders disappearing under certain circumstances, and an issue where the recipients name may be removed from the recipient list if it matches the sender's display name. KB4011726 -- PowerPoint 2016: adds help message for Microsoft Equation 3.0 and translation of the message that informs about the end of support for Microsoft Equation 3.0. KB4018320 -- Project 2016: fixes a Project opening issue that results in the error message "Sorry, we were unable to open your project. Please try again. If this happens again, contact your administrator.". Fixes a crash furthermore, an issue with Change Working Time dialog boxes, and introduces new information to projects saved in XML format. KB4018323 -- Skype for Business 2016 update. KB4018347 -- Word 2013: patches remote code execution and includes non-security improvements. KB4018350 -- Excel 2013: patches remote code execution vulnerability and includes non-security improvements. KB4018330 -- Office 2013: patches remote code execution vulnerability and includes non-security fixes. KB3178636 -- Office 2013: fixes a crash in Outlook 2013 when opening messages that contain byte-order mark or zero-width non-breaking space characters in the body. KB4018333 -- Office 2013: adds translations of messages that inform users why an Office add-in could not be loaded. Also, minors require parental consent to obtain or run add-ins from the online store. KB4018303 -- Outlook 2013: fixes a crash in Outlook, custom forms with Visual Basic Script issue in shared calendars, sent emails appearing in the wrong Sent Items folder, and authentication prompt that were locked behind the main Outlook window. KB4018334 -- Skype for Business 2015 update. KB2965234 -- PowerPoint 2010: Adds "appropriate help message" for Microsoft Equation 3.0. KB4018312 -- same as KB2965234 but for PowerPoint Viewer. KB3128038 -- Project 2010: adds new information to saved projects in XML format including name of views, tables, filters, groups, and more. KB4018317 -- Outlook 2010: custom forms with Visual Basic Script doesn't run in shared calendars. Update: Microsoft did release patches for Office 2007, SharePoint Server 2016, SharePoint Server 2013, Project Server 2013, and SharePoint Foundation 2013, and SharePoint Server 2013 as well. Microsoft distributes updates via Windows Update to consumer systems. All versions of Windows are configured to check for, download and install important updates when they are published. You may run a manual check for updates to pick up the updates as early as possible as the update checking does not happen in realtime. Windows runs a check for updates and will download and install those it finds automatically. Note: It is recommended that you create a backup of the system before you install updates as they may break things. Thanks a lot for this great summary ! Could you please double-check the downloadable Excel spreadsheet? The ZIP download is ~35.1KB but appears to be a corrupted archive. Thanks, fixed it. Please try again. Thanks, Martin. Sidebar: I have to change some of my Patreon “budget” and have added GHacks. This site is increasingly a go-to. These spreadsheets and coverage of the MS monthly updates are worth a lot in and of themselves! Thank you, I appreciate it. And thanks again for letting me know about the download issue. Great work as always, thank you for the direct download links. It would be nice if we could have links for the .NET Framework security updates too. Did Microsoft release security updates for .NET? Can’t seem to find information. Thanks, Martin, For guiding me Christal clear thru the 1498 Microsoft flavors of updates this mount again made so I could update to version 1709 (What a bummer that Windows pulled the spring update Windows 10 version 1803 build 17133) to build 16299.371. The total update did go quite fast (around 10 minutes) and the installing like a hot knife through hot butter. Hopefully, the next update ( will that be Windows 10 vrsn 1803 bld 17133? ) will go the same way. Any change that you know when the Windows 10 version 1803 build 17133 will go true? +1 on what Jay said! Your summary is almost priceless and saves us in the community a huge chunk of time – thank you so much. Just also became a Patreon supporter – please keep up the good work, much appreciated! Updates ran alright on my two Windows 7 64 bit systems. When I ran Windows Update on the Windows 7 x86 system, it caused a bluescreen every time the computer tried to start. It brought me into startup repair, and ran through a few things (and restarting a few times). Each time it would blue screen, and eventually just said that it couldn’t repair it (and would I like to send the report to Microsoft). I ran system restore to get it back up and running. I think it’s KB4093118 causing the trouble. This system didn’t get the March security updates due to Microsoft pulling them for x86. The March update still doesn’t appear as an option in Windows Update. I got the new style update notice for this one that I thought was coming in the spring update. This is the first update I actually received “automatically” with out any user input for a long time. 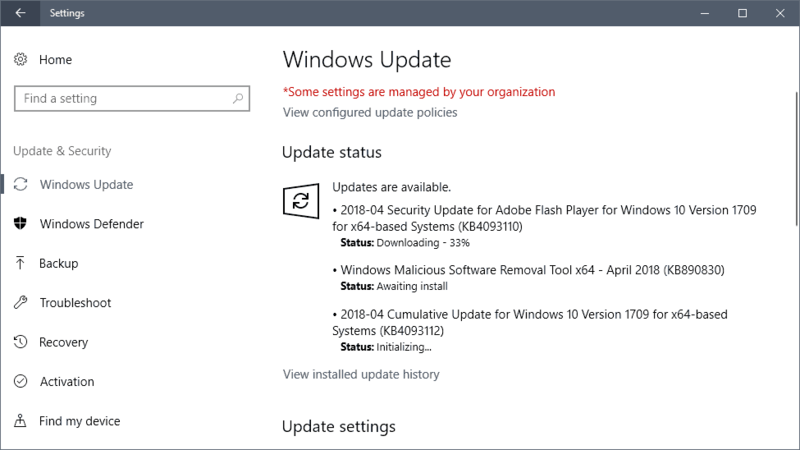 Is KB4100480 (https://support.microsoft.com/en-us/help/4100480/windows-kernel-update-for-cve-2018-1038) included in this month’s security update? After installing KB4093108, the above kernel update is missing from my Windows update list . My thanks also for all the hard work Martin. One thing I noticed especially this month was the difference in size between the security only installation for Windows 8.1 namely KB4093115 which was 16.3MB and its big brother, KB4093114 which is the quality rollup version weighing in at 321MB no less. Makes you wonder how much telemetry junkware M$ packed into that. I had a bunch of our computers lose internet connectivity after this patch on April 10th. Did anyone else experience that? Both KB4093110 and KB4089848 aren’t recognized as being installed & my laptop keeps restarting (thinks it needs to restart to complete installations). How do I have them as being recognized so my laptop stops restarting ?